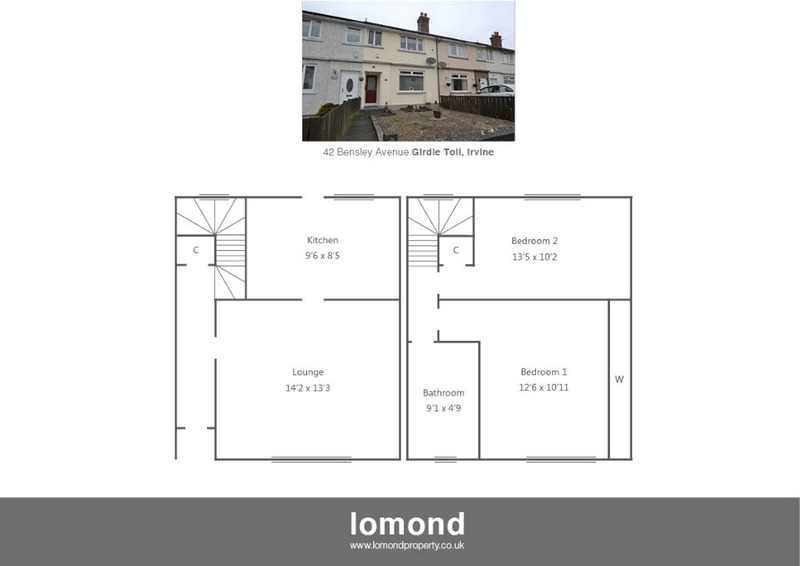 Situated in the ever-popular Girdle Toll area of Irvine, 42 Bensley Aveue is a spacious Mid Terraced House. The property has two double bedrooms and benefits include gas central heating and gardens to the front and rear. Entrance is gained via a recently installed “composite” front door into the hallway. The front facing lounge has a feature fire and access to the kitchen. The modern kitchen has ample wall and base units and gas hob with electric oven. A UPVC door allows access to the rear garden. On the upper level there are two bedrooms and the family bathroom. The master bedroom is front facing and has large mirrored wardrobes. The rear facing second bedroom is also a good size double and has a storage cupboard. The family bathroom is a white suite with shower over bath. Externally the property has low maintenance gardens to the front and rear. The front garden is chipped with slabbed path to the front door. The rear garden is sectioned with raised patio area, astro turf, and chipped sections. There is summer house to the rear of the garden. A timber fence encloses the rear garden. The property has gas central heating and UPVC single glazed windows. Benslie Avenue is a popular residential area in Girdle Toll which is within easy reach of Irvine Town Centre. There are amenities nearby and a frequent bus service to the Town Centre. Irvine offers a further range of amenities such as supermarkets, bars and restaurants. The train station offers a frequent service to Glasgow and other Ayrshire towns. From Lomond’s office continue along Bank Street and onto Manson Road. At te Stanecastle roundabout take the fourth exit onto Middleton Road and take first left onto Bensley Rise. At the T-junction take left onto Benslie Avenue and the property can be found on the right hand side. For Sat Nav purposes the postcode is ka11 1aj.